Maven is a tool used to build Java code, similar to ANT. However Maven has a number of advantages over ANT, the main one being it being able to automatically download a project's dependencies from a central repository. Maven's goals (similar to ANT tasks) are standard, for example, to compile the code is always mvn compile, where in ANT the command depends on the name of the target in the project's build.xml file. This article is intended as a quick getting started with Maven 2 guide. It will cover quickly creating a project skeleton by using Maven's archetype:create goal, as well as adding dependencies to a project. See resources at the end of the article for links to more in-depth guides to Maven 2. 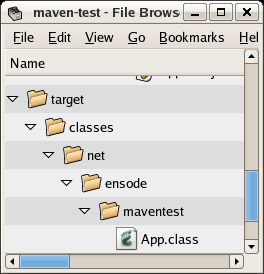 The above command tells Maven to create a new Java project, belonging to a group called "maven-test" (each Maven artifact belongs to a group), having an artifactId of "maven-test", and a java package of "net.ensode.maventest." After running this command, maven will create the directory structure for the project, along with a simple Java class with a main method, and a simple unit test. The following screenshot illustrates the generated directory structure and files. As can be seen in the screenshot, Maven creates a file called pom.xml, this file is analogous to ANT's build.xml file. It also creates a directory structure to place Java classes and unit tests. Although Maven doesn't force us to use its standard directory structure, it strongly encourages its use. Following Maven's standard directory structure allows developers to easily locate files through different projects using Maven as their build tool. 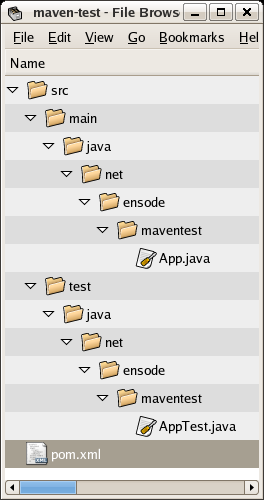 The generated App.java class is the typicall "Hello world!" sample application. It is meant to be modified in order to add real functionality to the application. If compilation is successful, Maven will create a directory called "target" under the project's root directory, this directory will contain the compiled class files corresponding to the Java source files in the src/main/java directory. The -Dexec.mainClass argument tells Maven what class contains the main method we want to execute. [INFO] Searching repository for plugin with prefix: 'exec'. The "Hello World!" line is the actual output of our code.